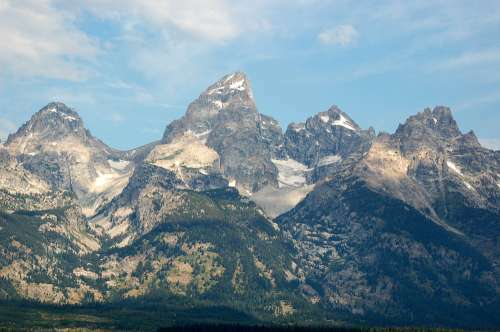 These are the four main peaks of the Grand Tetons, which are near the border of Idaho and Wyoming (this is on the Wyoming side). The tallest is actually called the Grand, but I'd need to consult a map to tell you what the rest are called. Thanks. It was hard to get a good shot of the mountains in the middle of the day like this, but we didn't have a choice because of our schedule. My favourite of your holiday shots so far, Brian, for the mountains' rugged presence and the wonderful play of sunlight and shadow.